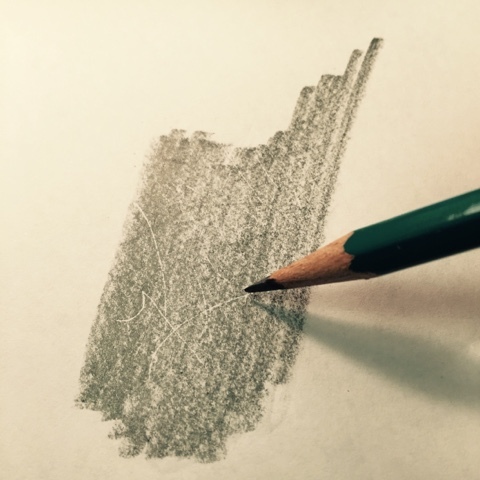 Over the years I have discovered quite a few basic, graphite pencil techniques I like to share with my students. I decided to post some of what I teach my kids. There are a lot of drawing techniques I require of my students. I believe there is more than one way to draw but I also believe there are some basic tricks that can help improve any dry medium drawing. I hate for my students to smear with their fingers and only use tortillions sparingly. I like drawings to include lots of microscopic details and I want my student artists to understand how to get the biggest bang for the buck out of their different pencils. One of the tricks I love is making deliberate indentions/scratches into a drawing to create tiny, white details. 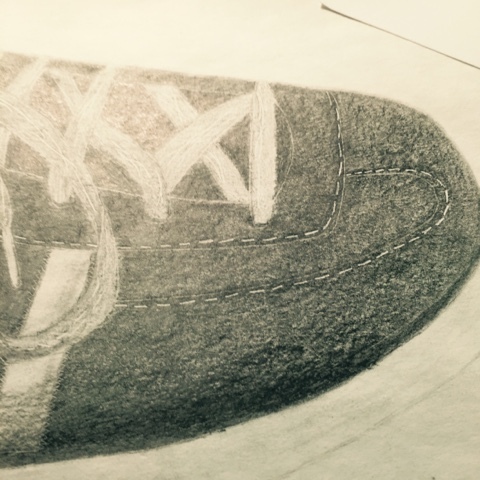 My second year students warm up with observation drawings of lace-up shoes and this technique works great to create tiny, white stitches in dark shoes. Most folks have had this accident happen especially in a sketchbook. You draw or write across a page not aware that your marks may be leaving indentions and marks on the next page. When you start the next page you discover you have scratches from the previous drawing that appear like a secret code in your new drawing.....disaster!!! I save old pieces of cardboard from sketchpads and packing and encourage students to use them as a buffer, sandwiched between the sketchbook pages they are working on the blank pages behind them. 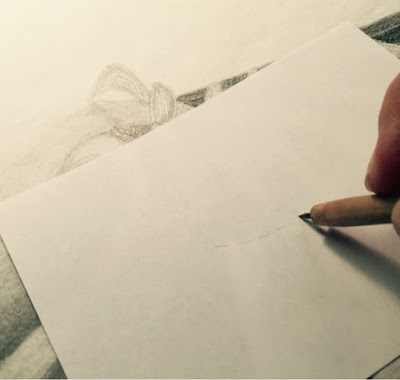 To create deliberate indentions/scratches like the tiny, white stitches, I lay a piece of typing paper or tracing paper over a drawing after I've created the contours and before I start to shade (be sure you can still see the drawing underneath). Then with a pointed tool, a stylus,or a mechanical pencil point with the lead pushed back inside - scratch into the page. Be careful not cut through the paper. 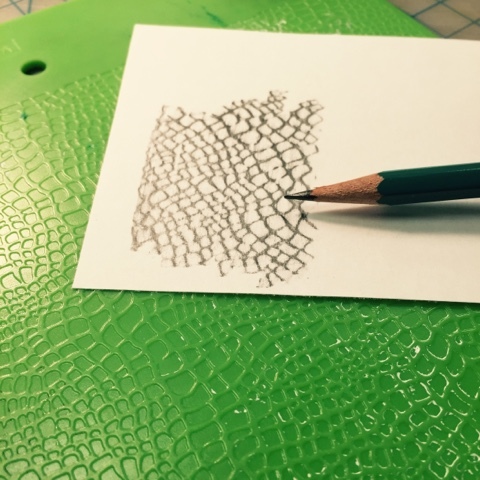 Another fabulous trick is to use rubbing plates or rough surfaces to make impressive textures in your drawings, This is a fabulous shortcut to create textures and patterns. I've had students quickly create the look of burlap or denim just by starting with a rubbing of those actual fabrics. I've also invested in a variety of commercial rubbing plates. This trick works best with a soft lead. Always practice a rubbing on a scrap paper before you apply it to a nice drawing. I often have my students work more marks over their rubbing to establish realistic cast shadows and highlights. 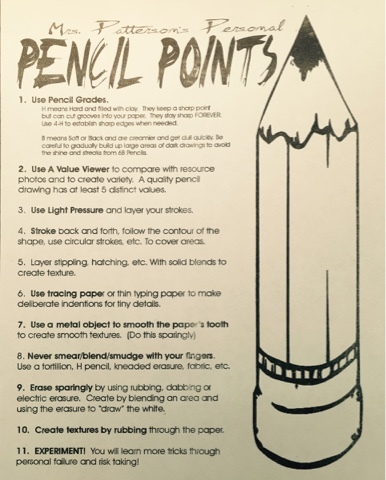 Here is a copy of my handout of "Pencil Points," Please feel free to copy and use it in your classroom or studio. Thank you, that was so informative! 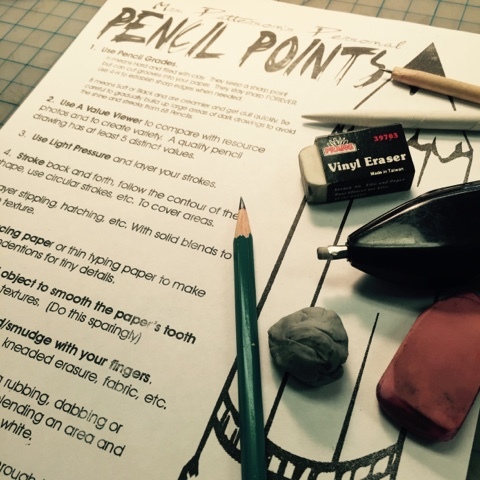 I never got to take art in school, so I feel on a par with your beginning students and appreciate the lessons you share; I will definitely try these tips - i would never have thought to use fabric rubbing to create texture. You are very generous! Thanks for the tips, they are very helpful. Thank you so much! I am wondering visiting your blog! Great! Though I am an artist or I have any passion in drawing, the article is neat and helpful for who are interested in learning drawing. Thanks for sharing with us.